Train hard, train smart with TYR Hand Paddle Replacement Straps. 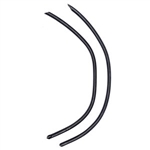 Feature latex surgical tubing for hand paddle strap replacement. Train harder. Swimmers of any level will appreciate the comfort of this jammer. ProLT construction delivers optimal stretch and recovery for a short that will last through the season. The MP Training Suit line was designed to specifically meet the needs of fitness swimmers who want classic designs with a hint of fashion to take them through every training session. You'll love the sporty designs, on trend colors and reliable comfort of these suits. This innovative rubber fin offers a whole new angle on training. Engineered with a unique 10º blade angle to provide maximum stability and engagement throughout the kick cycle. 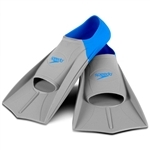 The booster swim fins are ideal for swimmers learning to swim. Perfect for new little swimmers, this durable jammer is designed to last through countless days of practice and lessons. The chlorine-resistant Lycra fabric provides maximum stretch for a comfortable fit that won't sag or bag, so his swim bottom will look good as new all season. An exclusive Block the Burn finish delivers UV50+ sun protection so he stays safe in and out of the pool. Make waves wearing this artfully printed Endurance+ brief, engineered from an exclusive and best-selling fabric designed to take you farther. Chlorine resistant to last longer than most swimwear, this style also features four-way stretch, so it won't sag or bag. Fishtail learn-to-swim fins increase children's confidence in the water. Designed to be worn as soon as a child is able to walk, Fishtail fins adapt to the movements of young swimmers. For Children 4-7 years old. The Speedo Aquablade Brief in Youth sizes features low drag, a slick surface and stripes that create a streamlined effect by channeling the water away from the swimmer. The 80 percent polyester and 20 percent Lycra Spandex blend is chlorine resistant and offers superior durability. The suit is fully front-lined and features a non-slip drawstring for a better fit. Promotes underwater swimming skills and confidence. The Hydra-Vision Jr. features all the technology and comfort of our award winning Hydra-Vision, but sized for youth swimmers or adults with a smaller face. Includes 2 black tubings of 3 feet each. Standard sizing fits most paddles. Designed to keep kids warm and protect them from the sun while allowing them the freedom of movement they need to play, train, or learn to swim. Your little explorer will love checking out the underwater world with a snorkel set designed just for them! This kids’ snorkel set from Aqua Lung includes the Regal Jr. Mask, Piper Jr. Snorkel, Tulum Jr. Fins and a convenient travel bag for easy storage. The mask and fins are both easy to adjust for the perfect fit. Designed for smaller narrower faces, The shape of the MDR Jr Swim Goggle offers the most universal fit outside your eye socket with the security. Featuring a narrower frame, the Zoggs Lil Predator Swim Goggle is ideal for kids aged 3-8. Great for snorkeling and recreational swimming. Includes 4 pairs of soft silicone material for young sensitive ears. Come with an easy to use plastic storage case. Cute little AWT (arena water tribe) swim seat that allows your baby to splash freely, in both safety and comfort. Builds confidence for a child already familiar with the water and is learning to swim. Ages 2-12 years / Max. Weight: 110 lbs. Engineered from Lycra Xtra Life fiber, the Core Solid Swim Brief is designed to last far longer than conventional swimwear. Perfect for snorkeling and recreational swimming. Silicone skirt for ultimate comfort. Builds confidence for a child already familiar with the water and is learning to swim. Ages 2-4 years. Weight Capacity: 33-45 lbs / 15-20kg. Featuring a long blade for extra power and force, the Trialon Swim Fin helps to elongate the kick and improve technique and speed. Promotes underwater swimming skills and confidence. Unbreakable, non-corrosive. Large 9" diameter rings for greater visibility. Youth Set perfect for snorkeling and recreational swimming. The Speedo Sengar Jr. goggles are an excellent low profile competition swim goggle, to fit for smaller/narrower faces. One size fits all silicon swim cap. Latex-free silicone provides flexible, optimum fit. Fun introductory silicone goggle. Soft, comfortable frame. Quick-adjust Speed Fit clips. Split silicone strap. 100% Latex-free. 100% PVC free. Ages 3-8. Featuring a silicone face skirt & an adjustable strap, this comfortable mask is suitable for young swimmers ages 6 and up. Mask + Snorkel Package featuring a two-window mask, dry top submersible snorkel with one-way purge valve and built-in signal whistle. Ages 6+. The Wave is a youth size recreational monofin that teaches younger swimmers the undulation needed for a proper dolphin kick. 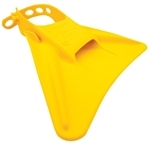 Safe to use in a pool, lake or ocean, the Wave will build a childs leg strength and make them a more confident swimmer. Made with Powerflex fabric, Speedos exclusive chlorine-resistant fabric, its designed to last far longer than conventional swimwear fabric. Four-way Stretch technology also provides a body-hugging fit, great shape retention and soft comfort. The grown-up version of TYRs best-selling kids swimple goggle, the Big Swimple is equipped with durable, hypoallergenic silicone gaskets that provide a comfortable, watertight seal and maintain their shape over time. The Seal Kid 2 by Aqua Sphere is a high-quality kids swim mask with easy-to-adjust buckles that blocks 100 of UV rays. Colorful, functional, and secure, the Kids Tye Dye Goggle is perfect for all your childs recreational needs. Fun goggle ideal for young and beginning swimmers. Soft silicone seals. Mask + Snorkel Package featuring two-window mask with 3-way adjust Pro Glide buckle, dry top submersible snorkel with purge valve. Mask + Snorkel Package featuring a two-window mask with 3-way adjust Pro Glide buckle, dry top snorkel with one-waypurge valve. Softer than any other Zoomers fins, the Z2 Zoomers fin is the most comfortable and easiest to use of all the Zoomers fins. With a short blade design, the Z2 Zoomers fin promote a shorter and faster kick for a better workout. The Fluid Separator slices through the water on the down kick, allowing the Hydro Channels to capture more water on the up kick for stronger forward propulsion. The center Flex Box targets and strengthens hamstrings and glutes. The ISHOF original SaferSwimmer Float is specifically designed to provide a safety aide for open water swimmers, serving three important functions without hindering performance or hindering your stroke. Quantity discount details below. A soft silicone short blade training fin helps to develop a stronger, faster flutter kick. Balances propulsion and kicking tempo, promotes short and fast kicks for the natural flow of a flutter kick. Made of 100% Silicone, provides optimum comfort and performance. 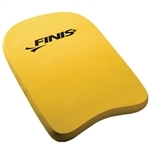 The FINIS Floating Fins increase leg strength and help athletes swim at faster speeds. With its long, hydrodynamic blade, the Floating Fins add propulsion to flutter and butterfly kick. The Aqua Lung Lanai Youth Silicone Mask and Paradise Dry Snorkel Combo has what you need for under water exploring. ages 7-12. Mask + Snorkel Package featuring one-window mask with 3-way adjust Pro Glide buckle, dry top snorkel with purge. Features dual composite, vented blade provides an efficient kick. Reduces strain, minimizes physical effort and conserves energy. Zoggs Aqua Plugz are advanced simming ear plugs ergonomically shaped for ultra comfort. Come with carrying case. The Kayenne opens up the playing field, quite literally. Oversized lenses with our patented curved lens technology gives you style while providing an undistorted, expanded, 180-degree field of vision. Suitable for ages 6-10. Enjoy the water with fun animal designs. Made from silicone for durability and chlorine protection. The Flexframes small, uni-body frame is designed especially for children and smaller adult faces. This google also features a easy-to-fit, pliable silicone frame that requires no adjustment, a split headstrap for secure fit includes easy-adjust side clips and safe, shatter resistant lenses that are anti-fog and UV protected. The original modable Silicone putty earplug. Focuses on comfort and molds to the unique contours of any ear. Recommended for kids 6 years old and under. Bright color is fun for kids and easy for parents to see. Plastic carrying case included. Ideal for swim training and regular use. 50% Polyester / 50% PBT. Perfect for both young competitors and begin to swim. Ages 3 to 10 years old. Designed for swimmers with a serious need for speed. Features a rigid frame for watertight seal. Low profile keeps the goggle close to the face. Comes with 4 interchangeable nose pieces. Ages 6 to 14 years old. Flexfins™ are engineered for swim training regiments and exercise routines. Designed to increase leg strength and enhance foot flexibility. The Flexfins™ are a perfect choice for swimmers at any level that are looking to increase performance and decrease times. Color-coordinated by size for easy identification on the pool deck. Engineered for young swimmers, the Multi Color Silicone ear plugs can be molded to accommodate different ear sizes and are designed to create a secure, tight seal that prevents water from entering the ears. Sold as a set of 6 the TYR Silicone Ear Plugs for kids include a carrying case for easy transport and storage. Designed for young swimmers, The Swimple Goggles feature an easy to adjust release button to allow for no-fuss headstrap adjustment, that children can adjust on their own. Suitable for ages 3-10.